Atul Kumar pointed to the pictures on the screen in front of him. Swiping one image after the next on his ipad, Kumar rummaged through a series of shots of art deco buildings in the western city of Mumbai; buildings he has known and loved for years. Now he is trying to bring them to the wider attention of the public, and put the city’s art deco heritage in a definitive way on the global map. In December last year, a small team assembled by Mr Kumar began working on documenting exactly how many art deco buildings there are in the city. Urban legend has it that there are at least 200, and anecdotally, Mumbai is believed to have the second highest number of art deco buildings after Miami. The city is best known for its triumphant 19th Century buildings like the Chhatrapati Shivaji Terminus railway station, the Bombay High Court, and the municipal headquarters. So its later structures have remained relatively less celebrated. With his passion project Art Deco Mumbai – a documentation endeavour, social media effort and soon-to-be-launched web repository – Mr Kumar is hoping to change that. He first began last year with online efforts to popularise art deco, posting images of individual stylistic features such as curving balconies, swirling grillwork and zigzagging facade patterns of buildings on Instagram, Facebook and Twitter. That initiative has since grown into a full-time project that aims to document every art deco building in the city. The team first chalked Mumbai up into zones, then sub-sections and then individual blocks, and have now completed the first phase by mapping the southern-most Colaba precinct. Of the area’s 367 buildings, they have zeroed in on 55 deco buildings. Each has been photographed extensively and profiled by element. Art deco as a style swept through the world beginning in the 1920s and flourished in Mumbai – then Bombay – between the 1930s and 1950s when a rash of such buildings sprung up in the burgeoning southern part of the city. Cinema theatres such as Regal, Liberty and Eros are some of the best known iterations of this style, with their geometric designs and spiky ziggurats. The sea-facing Marine Drive promenade is also a cornucopia of deco – and has 35 residential buildings boasting splendid cylindrical balconies, window ledges, or “eyebrows” and that bold, distinctive deco type face. The area is also part of the precinct named in the “Victorian and Art Deco ensemble”, a central government nomination as a Unesco World Heritage site. 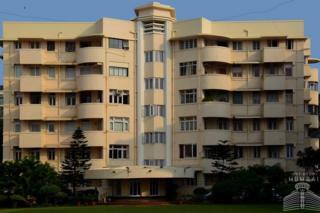 The sea-facing Marine Drive’s buildings though, are relatively well known. Mr Kumar and his team next plan to do field work in the Fort area or further north towards Peddar Road and Carmichael Road – expensive addresses whose deco buildings are barely registered in public memory. Even further north in Dadar and Matunga, Mr Kumar expects to find many more buildings. He estimates that a decisive count will take another year. Art Deco Mumbai has been entirely backed by him till now and will launch its website this month, an online database that will feature tales of the buildings documented so far, pictures, research papers and conservation stories from around the world. The record of preserving these buildings has been mixed – in the southern part of the city they have been better maintained, and protected thanks to a 2015 state government notification that prohibits unauthorised changes. But some have been damaged or altered in the preceding years. With Art Deco Mumbai, the intention is to highlight and help recognise the value of these structures. “Art deco was a crucial point as the first expression of a modern Indian architectural style,” said Prathyaksha Krishna Prasad, head of research and content of Art Deco Mumbai.